Library databases contain journal articles, books, images, music, and more. Use these guides to choose the best database for your topic. Provides full text for nearly 3,300 scholarly business journals, including full text for more than 1000 peer-reviewed business publications. Includes publications like the Harvard Business Review, BusinessWeek, Fortune, and Industry Week. Also contains company profiles, industry reports, and SWOT analyses. Coverage: 1886-Present; content updated on a daily basis. Provides full text for hundreds of journals and books and cover-to-cover indexing and abstracts and selected coverage for hundreds of publications. Variety movie reviews from 1914 to present and an image collection from the MPTV Image Archive are also included. A fully indexed, cross-referenced and annotated database of journal articles, books, book chapters and dissertation abstracts on all aspects of theatre and performance in 126 countries created by the Theatre Research Data Center (TRDC) at Brooklyn College. Includes full text for many of the top LGBT publications. Most of these titles are not available in full text from any version of Academic Search. Provides indexing and abstracts for hundreds of journals, books, and reference works. Contains records for more than 34,400 plays—published individually or in collections—dating from 1949 to present, and is updated on a weekly basis to incorporate new content. Available content includes nearly 800 monologues from many distinguished playwrights, including Aeschylus, William Shakespeare, Moliere, Anton Checkhov, Tennessee Williams and many more. Index of journal articles and unpublished research reports in education. ERIC can also be accessed via the U.S. Department of Education interface or via ProQuest. Provides full text for more than 520 journals, and indexing and abstracts for over 2,900 titles. The database also features over 340 full-text reference books and monographs, and over 36,000 full-text conference papers, including those of the International Political Science Association. Comprehensive index to thousands of journals in psychology from 1806 to the present; also indexes books, book chapters, dissertations, and reports. 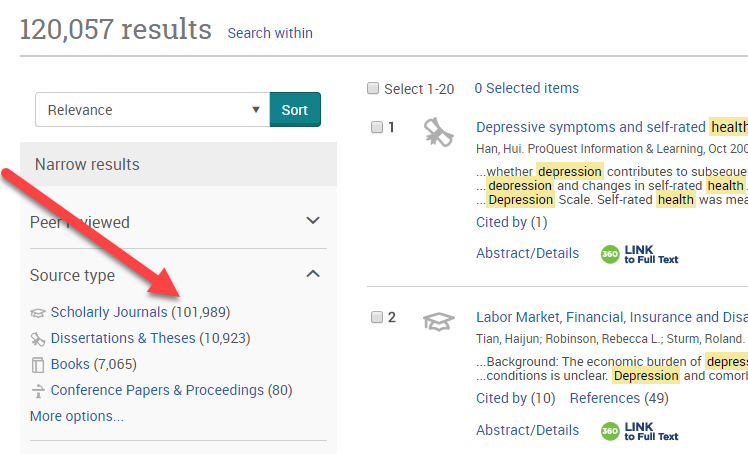 Please Note: Dissertations and books comprise 20% of the citations in this database. To limit your search results to journal articles from your search results, select this limit for scholarly journal articles.